Why you should enter Gloucestershire Young Musician of the Year 2019! Two dates for Glos Young Musician contest as deadline extended! The five finalists from left, Lydia Kenny (18) from Dursley, Louis Morford (16) from Cheltenham, Dan Gilchrist (17) from Cheltenham, Alex Waterman (20) from Cheltenham and Hannah Brooks-Hughes (13) from Stanway. Winner Hannah Brooks-Hughes (13) holding the Hewitt-Jones Trophy, centre, with, from left, Lydia Kenny (18) from Dursley, Alex Waterman (20) from Cheltenham, Louis Morford (16) from Cheltenham and Dan Gilchrist (17) from Cheltenham. Winner Hannah Brooks-Hughes, 13, receives a cheque for £500 from Lesley-Anne Gunn of sponsors Dee & Griffin Solicitors. Winner Hannah Brooks-Hughes, 13, receives the Hewitt-Jones Trophy from musician and educationalist Caroline Lumsden. Hannah Brooks-Hughes, 13, receives a cheque for £250 for the Audience Prize from Eion Schmidt-Martin of sponsors the Carducci Music Trust. 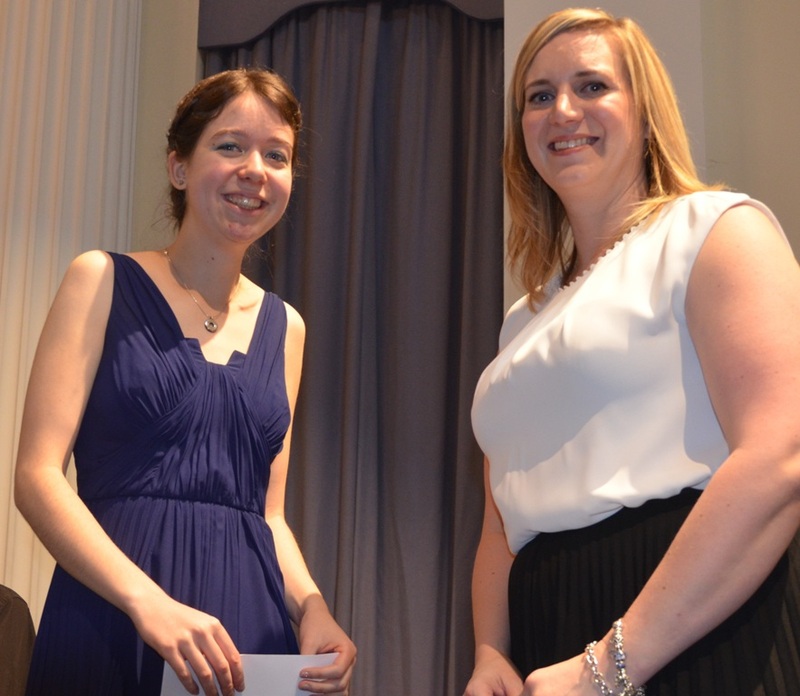 Runner-up Lydia Kenny (alto saxophone) received cheque from sponsor Lesley-Anne Gunn of Dee & Griffin Solicitors. Runner-up Louis Morford (violin) receives cheque for £100 from sponsor Lesley-Anne Gunn of Dee & Griffin Solicitors. Runner-up Dan Gilchrist (cello) receives cheque for £100 from sponsor Lesley-Anne Gunn of Dee & Griffin Solicitors. Runner-up Alex Waterman (flute) received cheque from sponsor Lesley-Anne Gunn of Dee & Griffin Solicitors. 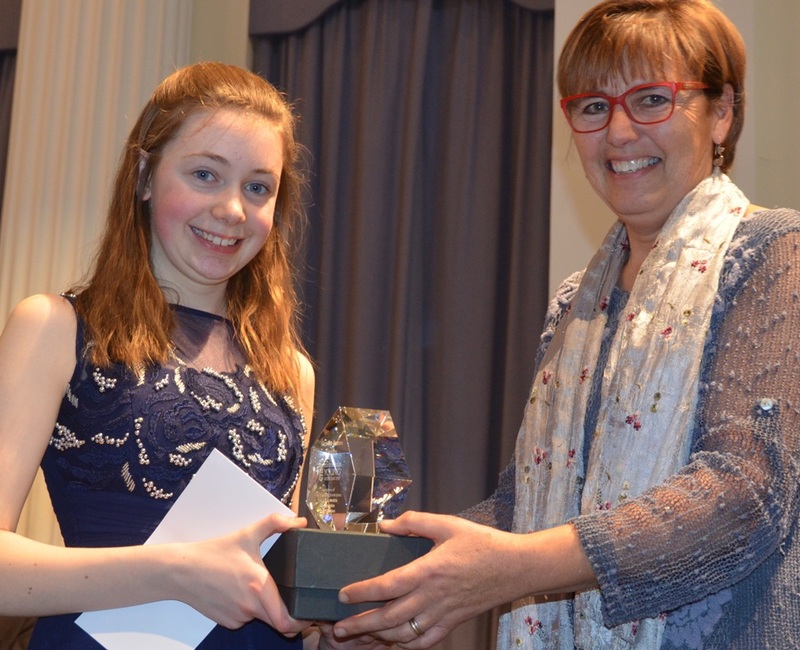 The prodigious talent of 13-year-old violinist Hannah Brooks-Hughes, from Stanway, wowed the judges and the audience in equal measure at the Gloucestershire Young Musician of the Year finals at Pittville Pump Room on Tuesday night (March 7). She took the title for 2017 and was also the audience’s choice – receiving two cash prizes totalling £750, as well as the Hewitt-Jones Trophy. She will also have the opportunity to perform at the Cheltenham Music Festival, The Carducci Festival at Highnam, as well as two concerto performances with the Gloucestershire Symphony Orchestra and county youth orchestra. Hannah, who began learning the violin at the age of four-and-a-half, was competing against four other superb finalists from all over the county. 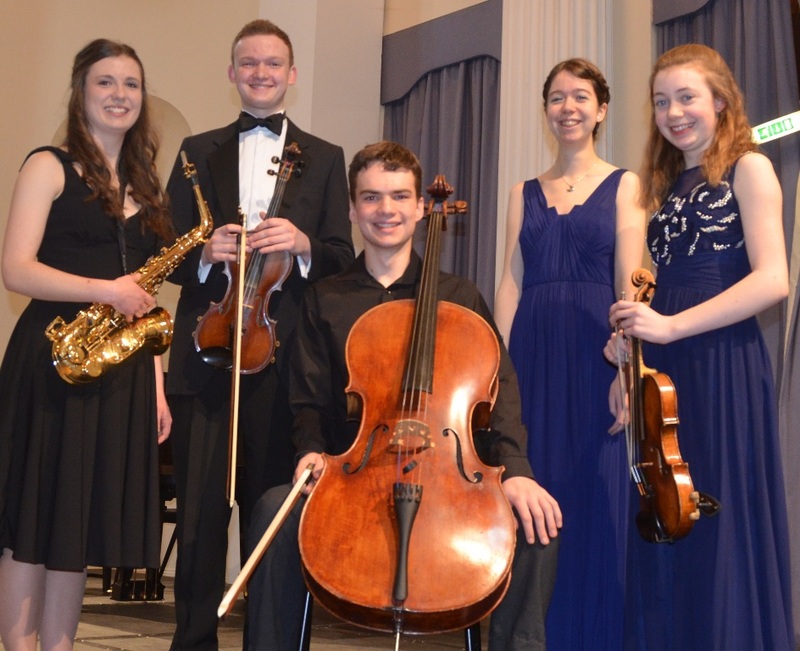 They were Alex Waterman (flute), Dan Gilchrist (cello), Lydia Kenny (alto saxophone) and Louis Morford (violin). Her delighted parents Barry and Naomi, and younger brother Hugo, shared her triumph at the Pump Room. Hannah is leader of the National Children’s Orchestra, and has played alongside international star Nicola Benedetti at Birmingham Symphony Hall. She was the youngest ever winner of the Two Moors International Festival ‘Young Musician Competition’ in 2014. Judging the Gloucestershire Young Musician contest were Meurig Bowen, director of Cheltenham Music Festival, Simon Haram, Professor of Saxophone at the Royal College of Music and violinist Lucy Gould of the prestigious Gould Piano Trio. She told the audience that all five finalists were winners in their own right with their superb performances. Presenting the prizes were Lesley-Anne Gunn, of sponsors Dee & Griffin Solicitors, music educationalist Caroline Lumsden representing the Hewitt Jones family and Eion Schmidt-Martin, member of the Carducci String Quartet, which sponsors the Audience Prize. Enter your email address to subscribe to this website and receive occasional updates by email.